I recently reread this book on a Kindle version because I had loaned my hard copy out which never found its way home. I thoroughly enjoy Walvoord on the Second Coming especially on the rapture. 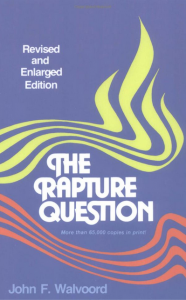 This book contains a progress of thought on the rapture in the New Testament, an evaluation of the recent postribulational arguments, and a concluding chapter of 50 arguments for a pretribulational rapture. I was pleased when I ordered a used hard copy of the book from Amazon and when I received it found that it has been signed by John. F. Walvoord. I don’t think it will be loaned out.